Invited - the user has been sent an invitation email but have not clicked the link in the email. Uninvited - the user has not been sent an invitation email. Confirmed - the user has clicked the link in the invitation email and has confirmed their account. Creating User - the user has clicked the link in the invitation email but has not filled in the required details to confirm their account. Rejected - the user has clicked the link in the invitation email but has advised they are not a member of the school. As users are created and managed outside of MyEDiary when it is used with one of our integration partners, the only actions available in this area for Integrated schools is managing invitations. Read more about integration here. All students who have not yet been sent an invitation email to the eDiary can be found by clicking the 'Uninvited' tab. 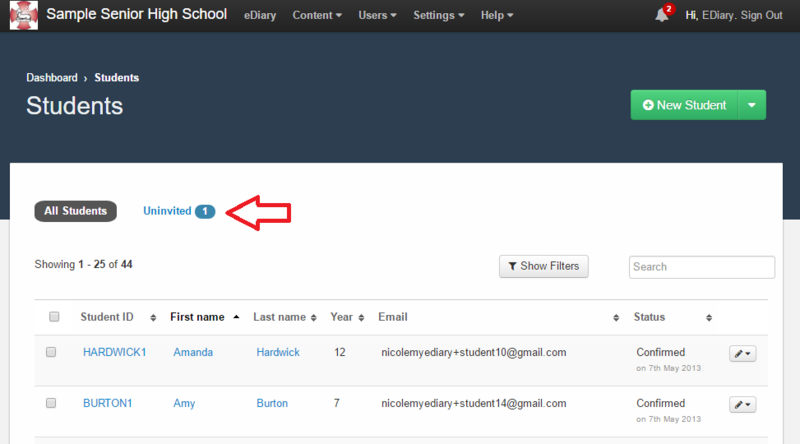 Or all uninvited students can be invited by clicking the 'Quick-invite all uninvited student(s)' button. To edit or delete an existing student, click the option menu beside the student then click the relevant option.